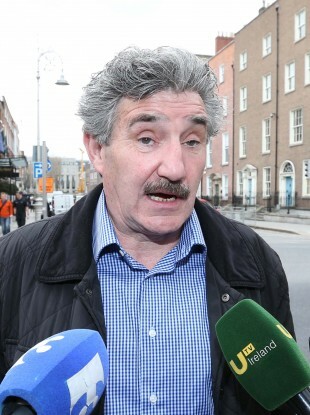 JUNIOR MINISTER JOHN Halligan has called on the gardaí to question the surviving Bon Secour nuns who worked in the Tuam mother and baby home. Last Friday, amateur historian Catherine Corless was vindicated by the commission’s confirmation that a significant number of children’s bodies were found at the Tuam site in a structure which appears to be “related to the treatment/containment of sewerage and/or wastewater”. In 2014, when the revelations first hit the headlines, a statement from high-profile Irish PR representative Terry Prone, on behalf of the Bon Secours order, said the “overwhelming majority of the surviving Sisters of Bon Secours in Ireland are over eighty. The handful (literally) still in active ministry are in their seventies”. The statement goes on to say there is “no mass grave” and “no evidence that children were ever so buried”. Halligan said the gardaí need to establish if a criminal investigation is warranted. If an individual has been an accessory to a crime then they should be held accountable, regardless of how many years have passed or their advancing age, he added. He said the surviving Bon Secours nuns should also be interviewed by the Mother and Babies Homes Commission on their knowledge of the post-mortem practices and procedures, reporting and burial arrangements for residents of the Tuam home. “I will not accept that they cannot shed some light on this disrespectful discarding of innocent children’s remains,” said the Waterford TD. The minister for skills and training said he also believes a criminal investigation needs to take place on the basis that children were neglected in the home. We have a duty to investigate, to set an example that such horrors will never again be tolerated in this country. Halligan also called for the Criminal Assets Bureau (CAB) to get involved in the case, stating that if the order is found guilty of criminal neglect, its assets should be seized. Speaking about other mother and baby homes around the country, Halligan said stories are emerging from these homes that are “no less gruesome than those at Tuam”. “Each of these homes needs to be investigated and the Catholic Church – which has to date been allowed to evade its responsibilities under the abuse redress scheme – should be held fully responsible. Addressing the Dáil yesterday, Children’s Minister Katherine Zappone offered a personal apology to those that have been affected by the recent discoveries. This House and our entire State owe a debt of gratitude to Catherine Corless for her work. Many men and women alive today spent time in that institution, either as children or as young women. Today I offer them my personal solidarity and, as a citizen, my personal apology for the wrongs that were done to them. Zappone acknowledge the calls for the commission’s terms of reference to be expanded to include other mother and baby homes. She said a scoping exercise will be carried out to examine if this is possible. The detail of this exercise will be released in the coming weeks. The second interim report from the Mother and Baby Commission will be published by the end of this month. A spokesperson for the Bon Secours order told TheJournal.ie that due to the ongoing work of the commission it is precluded from making any further comment on the issue. Email “Gardaí should interview the surviving Bon Secour nuns over Tuam burial site, says TD”. Feedback on “Gardaí should interview the surviving Bon Secour nuns over Tuam burial site, says TD”.